Silver had a very volatile year in 2011. According to Profit Confidential contributor Sasha Cekerevac’s recent article, "What You Need to Know about Silver Right Now," the most likely scenario is that the silver market is setting the stage for a resumption in the move up, with mining stocks to follow. When you consider silver was trading $16.00-$18.00 an ounce in early 2010 and then exploded to just under $50.00 an ounce in spring of 2011, this move was due for a healthy correction. 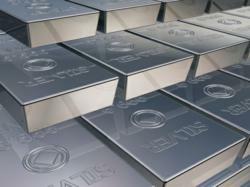 Silver had a very volatile year in 2011. According to Profit Confidential contributor Sasha Cekerevac’s recent article, What You Need to Know about Silver Right Now, the most likely scenario is that the silver market is setting the stage for a resumption in the move up, with mining stocks to follow. Cekerevac makes the case that the move in silver prices from 2010 to 2011 was far too fast and was due for a pullback. “This does not mean that the bull market is over in silver and mining stocks; far from it,” says Cekerevac. “When you consider silver was trading $16.00-$18.00 an ounce in early 2010 and then exploded to just under $50.00 an ounce in spring of 2011, this move was due for a healthy correction,” explains Cekerevac. One interesting note that Cekerevac highlights in his report on the price of silver is the move from the high last August 2011 and the lows in December 2011. “If we were to calculate the 50% retracement during that period, we would reach approximately $35.00. This is almost exactly the level we reached on this recent move up and is the first major test for silver on the way back up,” says Cekerevac.